The latest achievements and developments in the field of microfluidics and micro devices are gathered and presented here. If you have an achievement and want to be in this section, contact us. 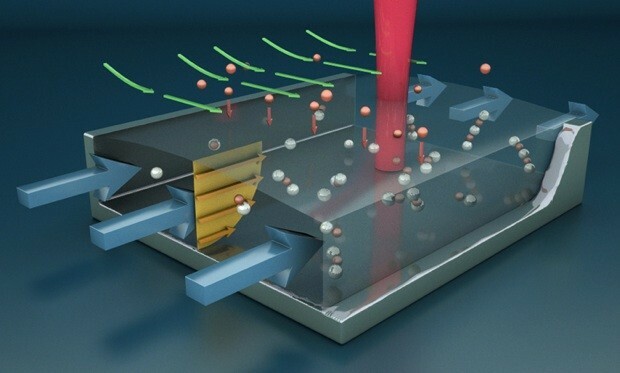 ScienceDaily: A new power-free microfluidic chip developed by researchers at the RIKEN Advanced Science Institute (ASI) enables detection of microRNA from extremely small sample volume in only 20 minutes. By drastically reducing the time and quantity of sample required for detection, the chip lays the groundwork for early-stage point-of-care diagnosis of diseases such as cancer and Alzheimer's. MicroRNAs (miRNAs) are small, non-coding RNA molecules that regulate gene expression in a wide range of biological processes including development, cell proliferation, differentiation and cell death (apoptosis). Concentration of certain miRNA in body fluids increases with the progression of diseases such as cancer and Alzheimer's, generating hope that these short RNA may hold the key to faster, more accurate diagnosis. Currently available techniques for sensitive miRNA detection, however, require days to reach a diagnosis and involve equipment operated only by trained personnel, making them impractical for use in many situations. The research team set out to overcome these obstacles by developing a device that enables fast, easy-to-use point-of-care (POC) diagnosis from only a very small sample. In earlier research, the team developed a device in the form of a microchip which uses polydimethylsiloxane (PDMS), a silicone compound known for its air absorption properties, to pull reagents into a capture probe for analysis. This pumping technique simplified design by eliminating the need for external power sources, but the device required a quantity of sample too large for practical applications. The new device also uses PDMS as an air pump, but drastically improves the method's sensitivity through a signal amplification method called laminar flow-assisted dendritic amplification (LFDA). First, DNA fragments which bond to specific miRNA sequences are fixed to a glass surface along with the miRNA sample to be analyzed, and then sandwiched under a layer of PDMS with channels in it. Emptied of air in a vacuum, the PDMS layer induces a pump effect which pulls amplification reagents, inserted at the channel inlets, into the channels and into contact with the miRNA, creating fluorescence-labeled dendritic structures that grow over time and can be quickly detected. The sensitivity of this technique drastically reduces the sample quantity required for diagnosis to only 0.25 attomoles (10-18 mole), a thousand-fold improvement over the team's earlier model. Together with its detection time of only 20 minutes, these properties make the self-powered device ideal for use in resource-poor environments, promising portable point-of-care diagnosis for millions in developing countries and around the world. Azonano: "We believe our microactuator is more efficient and powerful than any current microscale actuation technology, including human muscle cells," says Berkeley Lab and UC Berkeley scientist Junqiao Wu. "What's more, it uses this very interesting material—vanadium dioxide—and tells us more about the fundamental materials science of phase transitions." 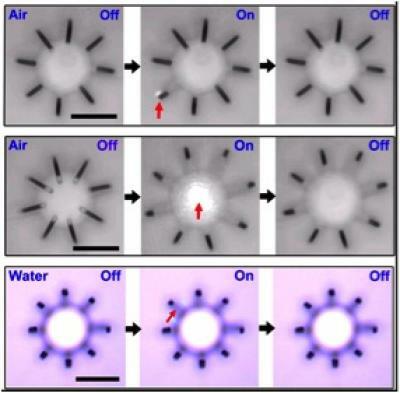 Wu is corresponding author of a paper appearing in Nano Letters this month that reports these findings, titled "Giant-Amplitude, High-Work Density Microactuators with Phase Transition Activated Nanolayer Bimorphs." As often happens in science, Wu and his colleagues arrived at the microactuator idea by accident, while studying a different problem. Vanadium dioxide is a textbook example of a strongly correlated material, meaning the behavior of each electron is inextricably tied to its neighboring electrons. The resulting exotic electronic behaviors have made vanadium dioxide an object of scientific scrutiny for decades, much of it focused on an unusual pair of phase transitions. When heated past 67 degrees Celsius, vanadium dioxide transforms from an insulator to a metal, accompanied by a structural phase transition that shrinks the material in one dimension while expanding in the other two. For decades, researchers have debated whether one of these phase transitions drives the other or if they are separate phenomena that coincidentally occur at the same temperature. Wu shed light on this question in earlier work published in Physical Review Letters, in which he and his colleagues isolated the two phase transitions in single-crystal nanowires of vanadium dioxide and demonstrated that they are separable and can be driven independently. The team ran into difficulty with the experiments, however, when the nanowires broke away from their electrode contacts during the structural phase transition. "At the transition, a 100-micron long wire shrinks by about 1 micron, which can easily break the contact," says Wu, who has a dual appointment as a professor in UC Berkeley's department of Materials Sciences and Engineering. "So we started to ask the question: this is bad, but can we make a good thing out of it? And actuation is the natural application." To take advantage of the shrinkage, the researchers fabricated a free-standing strip of vanadium dioxide with a chromium metal layer on top. When the strip is heated via a small electrical current or a flash of laser light, the vanadium dioxide contracts and the whole strip bends like a finger. "The displacement of our microactuator is huge," says Wu, "tens of microns for an actuator length on the same order of magnitude—much bigger than you can get with a piezoelectric device—and simultaneously with very large force. I am very optimistic that this technology will become competitive to piezoelectric technology, and may even replace it." Piezoelectric actuators are the industry-standard for mechanical actuation on micro scales, but they're complicated to grow, need large voltages for small displacements, and typically involve toxic materials such as lead. "But our device is very simple, the material is non-toxic, and the displacement is much bigger at a much lower driving voltage," says Wu. "You can see it move with an optical microscope! And it works equally well in water, making it suitable for biological and microfluidic applications." The researchers envision using the microactuators as tiny pumps for drug delivery or as mechanical muscles in micro-scale robots. In those applications, the actuator's exceptionally high work density—the power it can deliver per unit volume—offers a great advantage. Ounce for ounce, the vanadium-dioxide actuators deliver a force three orders of magnitude greater than human muscle. Wu and his colleagues are already partnering with the Berkeley Sensing and Actuation Center to integrate their actuators into devices for applications such as radiation-detection robots for hazardous environments. The team's next goal is to create a torsion actuator, which is a much more challenging prospect. Wu explains: "Torsion actuators typically involve a complicated design of gears, shafts and/or belts, and so miniaturization is a challenge. But here we see that with just a layer of thin-film we could also make a very simple torsional actuator." EnGadget: We're sure that most sniffer dogs would rather be playing fetch than hunting for bombs in luggage. If UC Santa Barbara has its way with a new sensor, those canines will have a lot more free time on their hands. 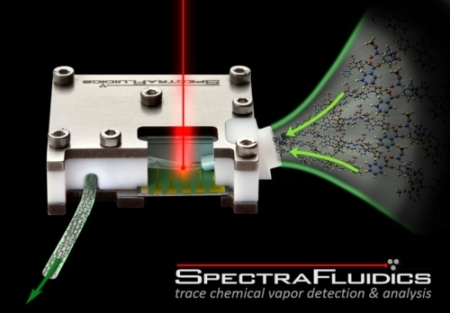 The device manages a snout-like sensitivity by concentrating molecules in microfluidic channels whose nanoparticles boost any spectral signatures when they're hit by a laser spectrometer. Although the main technology fits into a small chip, it can detect vapors from explosives and other materials at a level of one part per billion or better; that's enough to put those pups out of work. To that end, the university is very much bent on commercializing its efforts and has already licensed the method to SpectraFluidics. We may see the technology first on the battlefield when the research involves funding from DARPA and the US Army, but it's no big stretch to imagine the sensor checking for drugs and explosives at the airport -- without ever needing a kibble break. MedGadget: In an attempt to miniaturize and speed up testing of large numbers of chemical reactions for potential drug candidates, scientists at UCLA have developed a new microfluidic device capable of performing 1,000 simultaneous in situ click chemistry reactions, which can identify chemicals that bind to proteins. Because enzyme reagents required for in situ click reactions can be costly, the researchers believe their approach may save laboratories money, in addition to time and effort. Some basics about the chip design from the published article in Lab on a Chip:To reliably produce over a thousand reactions in a single operation, the 2nd-generation microfluidic chip comprises four components: (i) a pair of microfluidic multiplexers31 for regulating the 2 × 16 individually addressed reagent inlets; (ii) a 150 nL rotary mixer for mixing reagents for each reaction; (iii) a 250 nL serpentine channel to accommodate additional PBS to give each reaction the volume (400 nL) required for subsequent manipulation, and to complete the mixing of reagents; (iv) a replaceable 20-cm long poly(tetrafluoroethylene) (PTFE) tube connected to the outlet of the chip to serve as a reservoir for accommodating the reaction mixture slugs emerging from the chip. Following our previous protocol,13 a click chemistry library composed of 8 acetylenes (I–VIII, deployed in duplicate) and 16 azides (1–16) was assembled. Four different types of reaction conditions were tested in parallel to give 1024 individual reaction mixtures. These four conditions are: (i) 128 duplicated reactions with CuI-catalysis to generate reference products; (ii) 128 duplicated reactions between eight acetylene (I–VIII) and 16 azide (1–16) reactants in the presence of bCAII; (iii) 128 duplicated control reactions performed as in (ii) but in the presence of inhibitor 17 to confirm the active-site specificity of the reactions; and (iv) 128 duplicated blank reactions performed as in (ii), but in the absence of bCAII, to monitor catalysis-independent product formation. Engadget: It's hard to find a good specialist on earth, let alone when you're floating 240 miles above it. 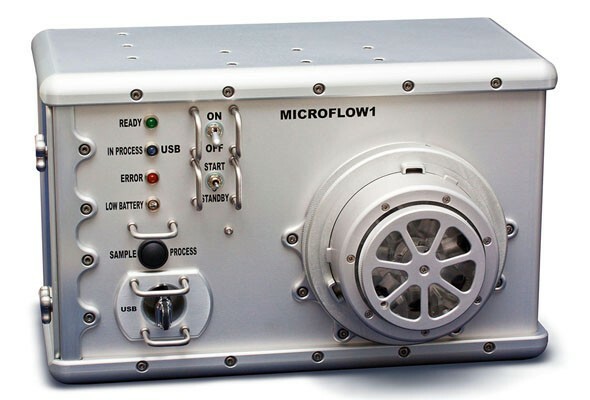 That's why NASA will test the Microflow, a breadbox-sized device that instantly detects cancer and infectious diseases, and can even sense the presence of rotten food. The Canadian-made device is a "flow cytometer," which works by analyzing microparticles in blood or other fluids and replaces hospital versions weighing hundreds of pounds. Here on Earth, the device could let people in remote communities be tested more quickly for disease, or permit on-site testing of food quality, for instance. It will be particularly advantageous in space, however, where Canadian astronaut Chris Hadfield will test it during his six-month ISS mission, allowing crew to monitor, diagnose and treat themselves without outside help.